A limited edition bottling from Glencadam Distillery. Clean and light Glencadam character in the smell, but with a fruity touch. Red berries, oak and marzipan in the background. The finish is long enough for the Port influence to come through. Vanilla and oak mixes with red berries and prunes in the taste. Just a slight bitter/soapy off-note from the oak, but nothing that disturbs too much. The Port influence really comes forward in the finish, with some dusty old oak on the side. 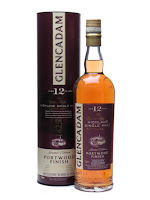 If you like Glencadam and you enjoy a good Port, you will definitely enjoy this. I know I do! And now I am wondering what a fully Port matured Glencadam would be like… I will give this 86/100 (22/21/22/21).